The Aim Center for Basketball Excellence! We take an inventory of the player, and develop a comprehensive list of the player’s strengths and weaknesses on the “offensive” side of the game using video. The training, instruction and drills are tailored to his or her needs to optimize his or her development and expedite the overall player development. THE AIM CENTER can accommodate as few as 5 and as many as 12 players, male and/or female. The group will meet 2x per week. Any missed will be made-up prior to the next session because of the “sequentially designed nature” of the program. Inventory of strengths and weaknesses , the focus is still on “all things offensive” and particularly shooting mechanics to yield more consistency, accuracy and un-stoppability of shooting /scoring. Each participant will be allowed to make up 1 missed session, anything beyond that must be addressed on a per incident basis and may be subject to additional scheduling related costs prior to any subsequent participation. ONE WEEK PERIOD, 9:00 am – 3:00 pm with an “after clinic” 2 hr program or study / breakdown of film session and history and theory of basketball offered to parents who can’t pick their children up until after work. Please inquire. These clinics are conducted Mon – Fri at the following sites at the specified dates inidicated. We bring everything to your site, shoooting aids and tools and training equipment. We also offer a “PHYSICAL EVALUATION OF YOUR GYM/BASKETBALL COURT OR FACILITY, INCLUDING LIGHTING AND LAYOUT. – You provide the facility, we provide the rest. Grades 1 through 8, using Math and Sciences, to aid children who play on their school teams or just recreationally or don’t play. We connect the dots for the students/players and the game of basketball with a special focus on shooting. Our hope is that it will be an enriching experience for all and create enjoyment of the sciences and math through the every day experience of basketball. Unique to THE AIM CENTER is our Youth coaches and parents clinics. We understand the investment in time and money that parents and coaches make in their children to make the game of basketball more enjoyable. 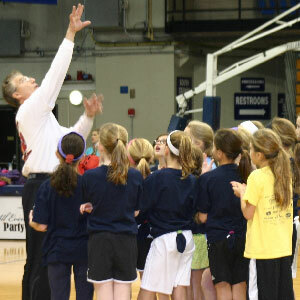 We also understand that parents and youth coaches may not have the experience to teach shooting. Coach Galo and THE AIM CENTER have years of experience and the passion to change the way shooting is taught. You no longer have to rely on what you see and what you hear. Coach Galo’s experience and credentials are impeccable. He will show you science based techniques that you can use to quickly teach your children and players. These are techniques that are not taught today. Your children and players will never have to spend the hours and hours of practice to learn how to shoot based on repetition and feel. Shooting a basketball is all about mechanics. Our science-based approach enables you to understand shooting quickly and to be able to use that knowledge to help your players learn quickly as well. IMAGINE A YOUTH TEAM OF SHOOTERS! FUN FOR ALL! Find out how Coach Galo can help you... Get a FREE Evaluation of Your Basketball Shooting!